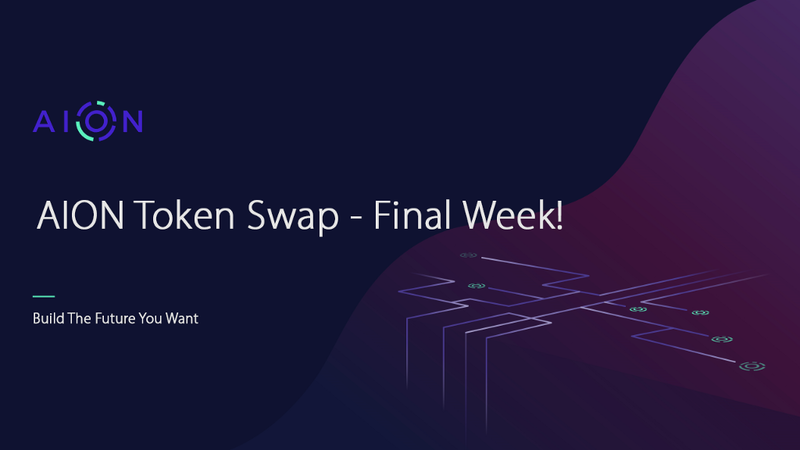 It’s the FINAL week of the Aion Token Swap, and we are humbled by the incredible involvement from our community members as well as our partners in the blockchain ecosystem. As of today, there are 15 exchanges and 7 wallets now supporting the AION Coin and the majority of the AION Tokens have been swapped. We are well on our way to exceeding our expectations for the swap. If you still haven’t swapped your AION Tokens to AION Coins, you have less than a week to complete your swap! We’ve outlined two of the easiest ways for you to complete the swap, please make sure you use one of these methods before the swap is over. The easiest way to swap your AION Tokens to AION Coins is to use Changelly. To participate in the swap and make sure you get your AION Coins converted into AION Tokens before it’s too late, click the link below. To read more about Changelly supporting the AION Token swap, take a look at the article below. Wanna swap your AION ERC20 tokens to Aion Coin? Do it with Changelly! AION Tokens can be swapped to AION Coins using the native Aion Token Bridge. For instructions on how to use the Aion Token Bridge, read the following documentation. AION Coin can now be purchased or sold on the following exchanges. AION Coin can now be held in the following wallets. The Aion Token swap is mandatory and will be ending November 30th. Please make sure to read the Token Swap announcement so you understand everything about the Token swap and why Aion is undertaking a swap from the existing AION Token (ERC-20) to the AION Coin. For a complete list of all swap options, please review our Token Swap overview documentation. The AION Token swap period will end on November 30th, at 23:59:59 UTC. After the official swap period has ended, we will commence a recovery process for all outstanding AION Tokens. More details on the recovery process will be released shortly. If you have any questions please reach out to support@aion.network. Final Week of the AION Token Swap was originally published in Aion on Medium, where people are continuing the conversation by highlighting and responding to this story.